The state Punjab, also known as the land of five rivers is bordered by Pakistani Province of Punjab on the west. And to demarcate the Indo – Pakistan regions there is Line of Control and three main borders in Punjab. 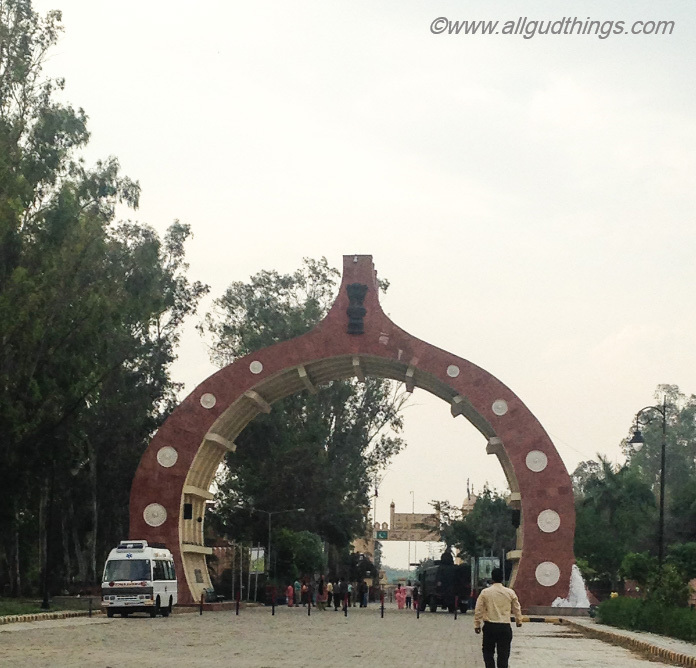 These are Wagah Border (near Amritsar); Hussainiwala border (near Firozpur) and Sulemanki border (near Fazilka). Out of all these three, Hussainiwala border is just an hour’s journey from my hometown (35 Kms from Faridkot and 110 km from Ludhiana). We had planned several times earlier to see the flag retreat ceremony but failed. Finally, it was this time to get immersed in the electrifying atmosphere of patriotism. The time to see; the lines of demarcation created by humans on map, land as well as in minds; the stomping and posing by BSF (Border Security Forces) Jawans of India and Rangers of Pakistan. The roads to reach the area are wide, clean and decorated with swaying golden wheat fields on each side. On the way, in evening you will only meet passing vehicles of army personnel and the travelers traveling to see the retreat. 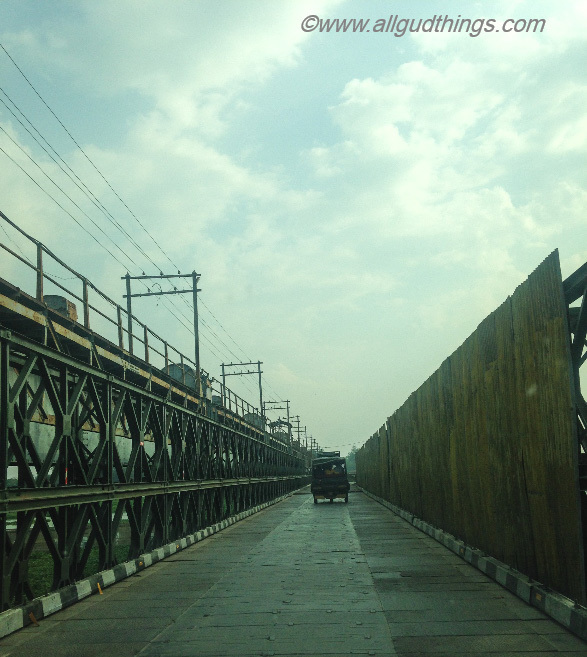 Before the border entrance, there is a huge Iron Bridge on River Sutlej which is closed on the Pakistan side. The Firozpur Border used to be the trade route for import of Kandahari Angoor (dehydrated grapes) and other fruits from Pakistan and Afghanistan, till 1970. Since then the border roads are closed and only evening flag retreat ceremonies take place here. The flag retreat ceremony started taking place here only after 1970 when Mr. Ashawani Kumar Sharma, BSF Inspector General called upon both the authorities and suggested to start the flag retreat ceremony. The ceremony happens at fixed timings everyday i.e. 5:30 pm in summers and 5:00 pm in winters and the whole ceremony lasts for half an hour. The entry gates open exactly half an hour before the beginning of the retreat. On entry, the patriotic songs were buzzing at full volume with the sun planning to settle down. There is an aroma of patriotism in the air. Meanwhile, some of the BSF Jawan’s were busy in settling down the crowd and they warned everyone from raising anti slogans. Once I settled down, I saw the Indian and Pakistan galleries are so close and opposite, we could easily see each other so clearly. Is this the white line on the ground and gates on that line which has demarcated us into India and Pakistan? Why was the feeling and simultaneously there were questions running behind mind; after all, we all are humans and creation of same God, then, why there is so much hatred. Before the retreat commenced there are a plethora of unstoppable patriotic slogans “Bharat Mata Ki Jai” from the Indian side, reciprocated by Pakistan from another side of the border. Then was the entry of real heroes of the show – BSF Jawans and Pakistan Rangers in equal numbers (not only men, women too). The BSF Jawans are dressed in their dress with red Peta whereas the rangers in black Kurta Pyjamas. The Jawans turn wise clatter their feet on the ground and stomp them in the air which is followed by huge cheer and applause from the countrymen. Rangers in response, try to give poses of being more fearless and aggressive. Each of them even widens their chests and to show their strength and anger. This is not all still the retreat of the flag is there and it is really interesting and jingoistic. The Jawans and Rangers cross the white line to come to the other country and form a beautiful cross X with the flag threads. Both the flags are held together at the junction and then are brought down at speed and folded neatly. It is actually a unique and amazing experience to witness the whole retreat. As soon as the flags are folded and handed over, the BSF Jawans ask you to leave the premises. They ensure that the civilians intentionally or unintentionally should not cross the borderline. Do remember to carry the Identity card with yourself. There is an entry ticket (unpaid) or VIP Pass for the ceremony (which you get after showing I card). The ticket is equally important for the exit too. Losing ticket means inviting a trouble for yourself. The Jawans will kill you with the questions as well as think you have come across the border. I will say God save you here. VIP Passes will land you sitting in the front row on chairs and general ticket on stairs. I personally feel that location for general ones is better than VIP’s for good clicks and one feels more enthusiastic there seeing the whole crowd cheering up. In summers, the sun is on your head, so bring your umbrella as well as sun shades. You can carry your snacks and water bottle inside but do remember to bring them out too. Littering is not allowed and it helps to keep the premises clean too. 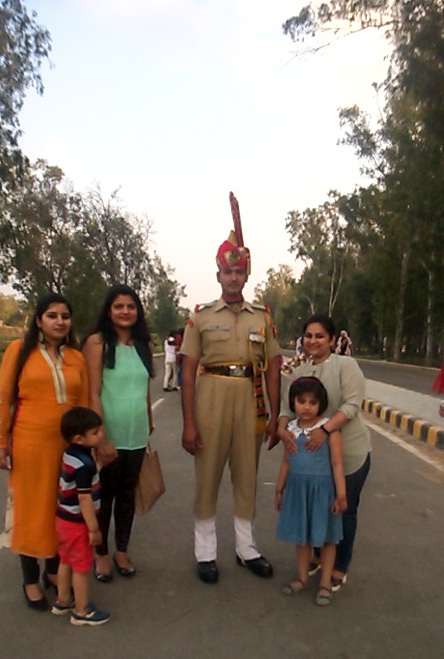 Ask for the permission to click the picture with the BSF personnel. They won’t say No and they actually like getting themselves clicked. 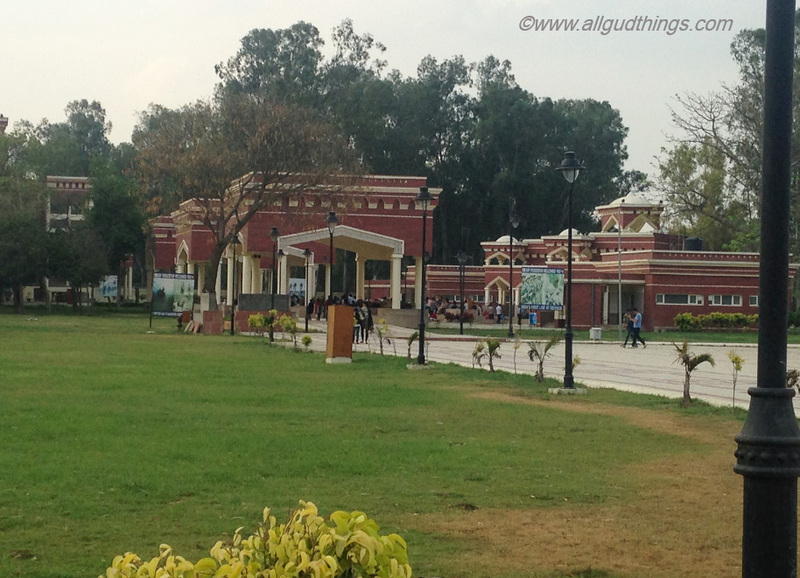 Nearby, there is a park where memorials of Shahid Bhagat Singh, Rajguru and Sukhdev are built. If you have time go and pay tribute to them. Don’t dare to raise any anti-national slogans as you will be chucked out and punished for the same. If elders are accompanying you, there is an indoor electric car which can help them till the ceremony area. Weekends are more crowded than the weekdays at Hussainiwala Border, as locals flock to see the ceremony, so plan your trip accordingly. Both the countries India and Pakistan might have enough hatred for each other but the Border is one place where both the countrymen are enough civilized, happily cheerful and performs the same consensual rituals and now this ceremony had been happening for years. I just hope that similar understanding might solve the other problems between two nations and maintain peace. If you like it, please pin it and share it. I agree that we should always be mindful during this moment. This is a great experience worth sharing, thank you! I appreciate you sharing the videos and also some important points. Your photos are amazing! Definitely inspired to visit here now! Very informative indeed! Thank you. Wow, packed with so much info. What a great post! This looks amazing! I would love to go to this place and experience the vibes! The War vibe! I love it! Thanks for sharing! Cheers! So nice indeed that there is a place where people from both countries manage to act like considering human beings with each other. Let’s hope their example will spread around. Great ceremony to write about, thanks for sharing! Wow, seems like an amazing and unique experience! Wow what a fun and informative little adventure you got to go on!! Ceremonies like this always bring me back down to reality and makes me appreciate things a little more. Especially where I live and the the life I lead! Great tips for going there too! This is so cool! I’ve heard about this ceremony, but haven’t read about anyone’s personal experiences. Awesome. WOW! What an amazing ceremony between nations that dislike one another! I love seeing things like this. That is really interesting. I actually don’t have a clue what the customs are or really ceremonies like this happened. Thank you for teaching me something new and giving me a peak into a different culture. 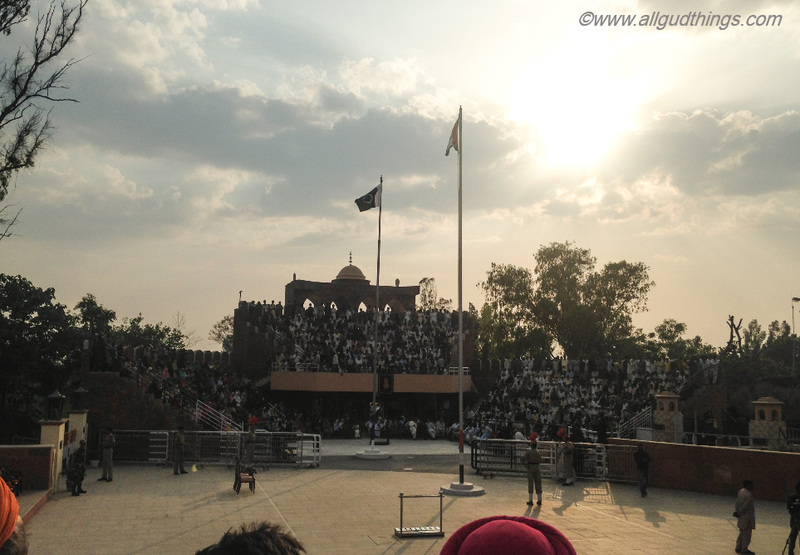 Visiting the Wagha border and witnessing this wonderful ceremony has been a long time wish. We had no idea this happens at other locations too like the Hussainwala border. The ceremony must be one of its kind of experience. There is so much crowd is it same all the time? We really hope that the issues are resolved between the countries and the golden times return. Interesting post! We had only heard about the Wagah border. Didnot know about the Firozpur border. Will keep it in mind. Thank you for the tips. I bet it was a great experience! This ceremony is the proof that two nations can put their differences aside if they really want to. I hope things will only get better from now on. Great post. Thank you for reminding us of the important points, which I noted. It is on my bucket list. Thanks for the insight into this tradition and how to navigate it! It’s good to know they can be peaceful during this time. Wow didn’t know about this. Thanks so much for sharing it. Such an informative article. I had never heard of this ceremony- thank you for sharing! Very cool post. I love learning about new cultures and events I have never heard of. Wow! Very little is known about this place. 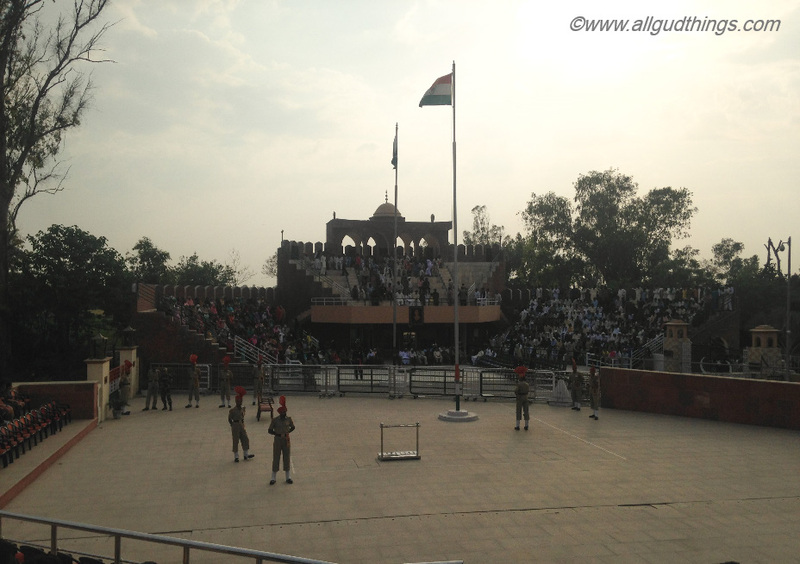 The Wagah border is quite famous, but the sensation here is the same. My colleague told me about this, and my Pakistani consultant showed it to me on youtube. It’s bizarre! As a side note, you have the same word for grape as we do in Malaysia! Maybe we got ‘anggur’ from you! Is a desiccated grape the same as a raisin, or is it different? Thank you for sharing. Great information if I decide to visit India. The country has intrigued me lately. I’ve seen a lot of photos and blogs that share the beauty of this country. What an interesting ritual. That every day this border comes together and shows mutual respect while otherwise being so hostile is just fascinating. Thanks for sharing your experience. I have been wanting to witness this flag retreat ceremony for son long now. Should do this soon. Thanks for the great tips. Surprised to see that general entry is better than the VIP ones! It’s interesting post! I hope that the problem between two countries would be solved in the future! Nice article. I too, don’t see why there has to be so much hatred between India and Pakisthan. Why can’t we all just get along. sigh. Anyway, thankfully people who think like us will one day be the majority and shut down the hatred. I had no idea about this ceremony nor its history! Thanks for capturing that! The flag retreat ritual sounds fascinating. I really don’t know anything about the history between India and Pakistan, but it’s good that people are civil to each other at this ceremony. I am also glad to read that antinational slogans are not allowed here too. Would this be an appropriate ceremony for someone who is neither Indian nor Pakistani to attend? Yes you will enjoy it more than us. What a cool experience. It is good to see that patriotism and civility remain at the border. Not sure I would have ever known about this ceremony. Thanks for sharing. How very interesting! I like the part of the story where the workers at the border are friendly enough with each other. Do many tourists attend this type of ceremony? Yes you can definitely attend it. Great post! Gotta try this very soon too! Thanks for sharing! Cheers! This ceremony looks quite amazing and glad to know that there is a place where both the countries act civilized! Looks like you had a great time! Wow, this is so awesome hearing first hand accounts of these types of experiences. I would love to visit sometime. I did get goosebumps while reading this. It is an amazing feeling watching these ceremonies. I have seen one at Wagah border. The energy and enthusiasm of both the civilians and the army personnel is unmatchable. Great article and a good video. I would love to witness a ceremony like this for myself someday. It was wonderful to read about your experience. The post gave me goose bumps. I haven’t had the good fortune of witnessing this yet. Fantastic pic with the jawan. The rest of the world could learn a thing or two from this! Thank you for sharing. It’s so sad that lines on a map create so much hatred. Here’s to a world without borders. Great post. I can feel that this ceremony is something for India and Pakistan. I will never understand why people hate each other so much that complete people can´t live with each other in peace. It happens all over the world and not only between India and Pakistan, I cannot understand why. Thanks a lot for sharing this special moment. What a curious ceremony, thanks for the video. Do you think that people on each side of that white line are very different? Interesting post. Never heard of a flag retreat ceremony before. Moreso, it is between two countries that do not like each other. Very nice and informative. It is on my list to go there see it, have some friends who have been there and they loved, I was looking at your videos and it just made me want to go there soon. It is a great moment!! This is informative and quite amazing. I didn’t know something like this can happen in a borderline. We all desire peace and happiness, thanks for sharing this. Although I live at the other side of the world, sadly, I know about this difficult relationship between these two countries .. I hope they can resolve their issues one day, and that we’re one step closer to peace for everyone .. Beautiful post! Great information and thanks for sharing! 🙂 We can all use a little bit more of tolerance and respect towards all other cultures. When I visited India, my friend who lives there wanted to take me to see the ceremony but unfortunately the mother of his good friend died so we couldn’t go anymore. It looks like a fantastic show and it’s interesting to see two nations that hate each other being friendly in this ceremony at the border. Thank you for sharing. I am especially touched by the reverence shown to elders. 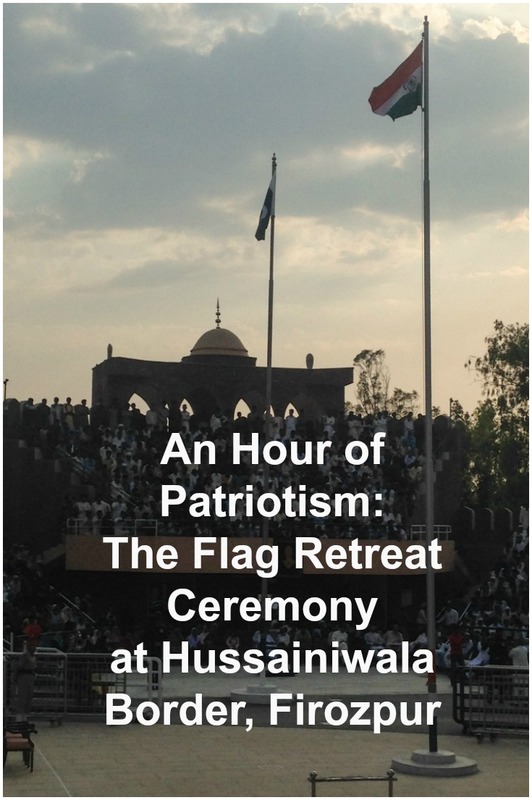 Till I read your post, I only knew of the Wagha border for the flag retreating ceremony. Now that I know the other two locations as well, I shall plan a trip to visit all the 3 places. I have heard that the Wagha border ceremony gets quite crowded but your pictures of Hussainiwala look otherwise. So, this looks like a good place to avoid much crowd. wow, you have just brought me to a rich memory of the past by reading this blog post of yours. I actually haven’t heard about this one and its actually really interesting. It is always great to recall the rich memory of the past by celebration. Thank you so much for sharing this one with us. I am not familiar with this ceremony. What a great message. Hopefully, the peace around the borders will spread wide into both countries. The hussainniwala border is a most go place if patriotism flows in you. Its has a remarkable background and the best memorial to the freedom struggle. The old feel of the place will like take you back in the old times. This seems to be more peaceful than the one at the Wagah Border. Liked reading about this one. Thanks for sharing fascinating info and photos of this place! This was a very interesting and informative post! It looks like such a beautiful place. I think everyone could learn something from this post. Two countries coming together and respecting each other despite their differences. Interesting! Not so familiar with this place. Learnt a lot from your post though. Love your shots! I was unknown with the fact that there are two other borders just like Wagah Border. This is information is truly important. I would visit this places. Patriotism should always be with us. We always should be proud of our nation. Cool photos btw! Interesting post! Like the fact that there are some interesting insights which you won’t find at many other blogs! thanks for sharing! Love this post! May be because I have never been there! The mention of Wagah border is enough to spruce up the patriotism within. thanks for sharing this blog post. Did not know that bit about it being a trade route for Kandahari Angoor. These flag ceremonies fill you with so much of patriotic feeling and it is nice to be that way too. I would love to witness this one – as it seems fairly less popular than the Wagah one. Lesser crowd I suppose. When I read the sentence, “the Jawans will kill you” for losing ticket, I was like, that’s kinda harsh! Then I realized you meant kill with questions and I was like, ahh… Obviously, the ceremony is such a big deal that they even issue tickets to people to come witness it. This is absolutely so beautiful. I must frankly tell you that I had not heard of Flag down ceremony at Firozpur. I guess all the limelight has been hogged by Wagah border. Now that I know, I am going to make plans to visiting this place.